Post time to comments. Compare to 8/24/10, 5/10/10, 5/10/12, and 4/15/13. WOD DEMO - Nasty Girls from Ely Albalos on Vimeo. 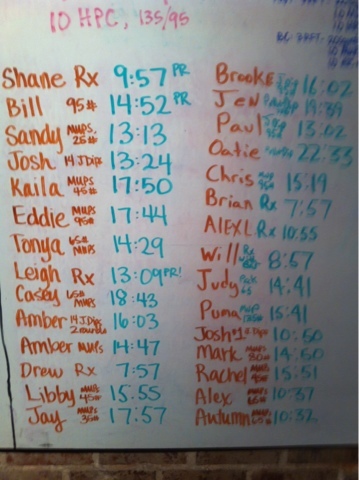 Scaled WOD courtesy of BrandX. Scales may be modified by Coach Drew. 2 PRs this morning so I am very excited! 5 MUs in a row and then a 9:57 time on the WOD! Great job to everyone else this morning-Josh killing the 2-1s, Kaila on the MUPs, and Mr. Bill and Ms. Sandy holding the front of the box in check! 14.52 95lbs - 3 MUs in a row. The leader boards are getting a makeover this month - WOW! Lots of PR's so far today and some really good looking MU from Bill Myers! 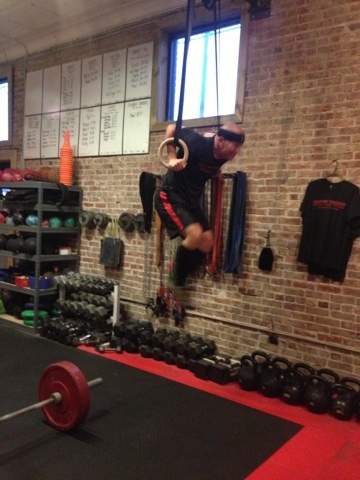 Great job on your PR Shane - good looking muscle up sequence too! Our wod was brought back old school sweat fest style from the warehouse space. Well sense Bill is going to blog about food I will to. sorry i no showed today! i had every intention of coming, but my dog kept me up all night, so when my alarm went off i didn't even hear it until 5:20. i tried to un-register for the class, but had already been marked as a no show. how is that software updated so quickly?? Sheena I don't think the software has a grace time, but that is some good feed back:) it is even better u used your dog as an excuse! Come tonight just so I can see what u look like in the evening. I just cancelled :( I'm stuck at work and not getting outta here anytime soon. Sorry coach! And...I couldn't figure out how to cancel on my iPhone. I pulled the meat from the bone. I ate the ends and the rib meat around 3oz. And an apple. Nasty this was indeed!! l am really hoping my arms work tomorrow after the 3 rounds of 21 pull ups and dips! Doh! I didn't know I could blog it Drew!